A bad shooting night for the Pokes results in their fourth B12 loss. It wasn’t an attractive game to watch, but Oklahoma State’s defense kept it around for a while. 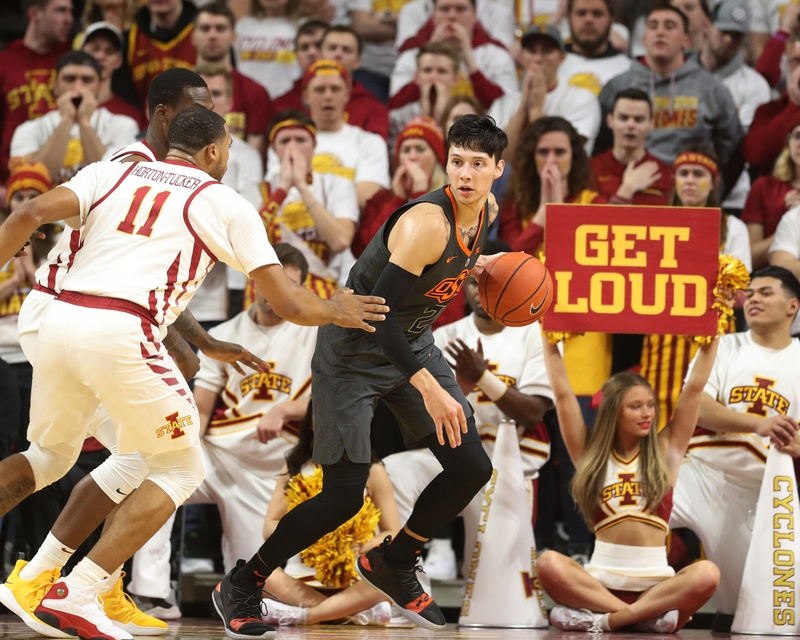 The Cowboys fell to Iowa State 72-59 on Saturday in Ames in the Pokes’ first game since Michael Weathers, Maurice Calloo and Kentrevious Jones were dismissed. It’s tough to draw too much from the game, considering it was the first time to Cowboys had to play with such a shallow bench, but I think it’s safe to say it’s not an ideal situation to be in. Here are five thoughts from the Cowboys’ 10th loss in 18 games. Midway through the first half, OSU went on a 10-0 run to take a 22-21 lead — Iowa State responded with an 8-0 run. Early in the second half, OSU went on a 7-0 run to cut the Cyclones’ lead to 42-40 — Iowa State responded with a 7-0 run. The Cowboys were 7-for-27 from 3-point range, and one of the makes was this one. Thomas Dziagwa and Curtis Jones, two guys whose biggest assets are their 3-point shooting, were a combined 2-for-16. There’s not too much to say about that, other than it was a rough night. Dziagwa entered the night a 45 percent 3-point shooter on the year, and Jones shot 37 percent from deep, so the duo’s 13 percent will likely be an outlier at year’s end. Not all of the Cowboys’ attempts looked like that Duncan Demuth shot, but there were a few more late shot clock heaves. OSU also missed some open ones, though. You can’t blame the poor shooting performance on tired legs, as OSU was just 2-for-11 from deep in the first half. The dismissed trio of Michael Weathers, Maurice Calloo and Kentrevious Jones had made only six 3s this season, so that wasn’t it either. So, I guess you just chalk it up as a bad shooting night. It certainly doesn’t make anything better, but at least it’s not a larger problem. Lindy Waters fouled out late when the game was already out of reach, but for the most part the Cowboys stayed out of foul trouble in their first game with nine available players. Yor Anei was the big question mark. He entered Saturday with a team-high 57 fouls, but against Iowa State Anei had only one personal foul. Anei’s prolonged minutes provided the Cowboys with nine points off 4-of-5 shooting to go with a career-high 12 boards, an assist and three blocks. Anei did have a worrying five turnovers, though. Waters was the only Cowboy with more than three fouls, and at the half no OSU player had more than two. It was hard to decipher through the broadcast, but I believe Mike Boynton was yelling “hands” anytime an Iowa State player was driving the lane. Boynton would also raise his arms to the sky in hope his players would do the same without fouling. It might keep OSU from keeping active hands and getting steals. The Pokes had only four steals against the Cyclones and didn’t force a turnover in the second half, but it might be a price you have to pay when you can’t afford to get anywhere close to foul trouble. Iowa State’s Marial Shayok averages 14 field goal attempts and a team-high 19.4 points a game. On Saturday, Shayok was 6-for-14 with a game-high 20 points. If Lindy Waters and Cameron McGriff shot at that volume, I think it’d be of benefit to the Cowboys. McGriff is averaging about 11 shots a game, and Waters is averaging only eight. Especially without Michael Weathers, who put up a lot of shots, and given there are only seven other guys on the team now, it’s important the ball gets to the best players on offense. I’m not saying it’s time to iso Waters or McGriff on the majority of possessions, but if the Cowboys offense is to sputter (which it has a lot this season) get it to one of the two and let them go to work. McGriff is a guy who scores a lot of his points off his hustle, like so. But, he also has a nice turnaround fade that he hits with consistency, and his pull-up game was developed nicely over the years. Waters has been deadly this season in the catch-and-shoot game, but some of his prettiest buckets have come with isolated pull-up jumpers like this. Isaac Likekele (37) and Yor Anei (31) each set new career highs with minutes played Saturday. On top of that, Cam McGriff, Curtis Jones, Duncan Demuth and Luke Major each played more minutes than their season averages. This might be the new norm for Likekele, a freshman, who without Michael Weathers and the previously departed Mike Cunningham, is the Cowboys’ only point guard left. It’ll be a similar story if Anei can continue to stay out of foul trouble, as without Kentrevious Jones and Maurice Calloo the Cowboys are as thin as the chances Oklahoma plays a quarterback who came to OU as a freshman. Curtis Jones’ minutes average will also continue to shoot up given he is now the Boynton’s only real option as a sixth man.